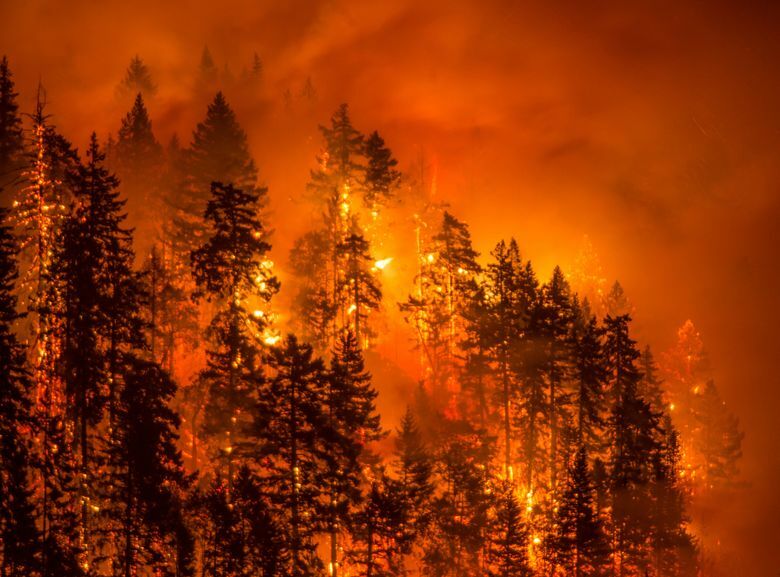 Continued dry weather and wind are contributing to the growth of wildfires in Washington and Oregon, which have threatened homes, prompted evacuations, closed some popular ski resorts and hiking trains and caused the governor of Washington to declare a state of emergency. Ash from the fires has even fallen on the Seattle area. Close to Seattle, the National Park Service has closed the inbound visitor access to Mount Rainier National Park at the White River entrance Visitors at Sunrise and the White River Campground are being advised to leave. In addition, State Route 410 east of Cayuse Pass will remain closed through Saturday because of fires in the Norse Peak Wilderness outside the park. 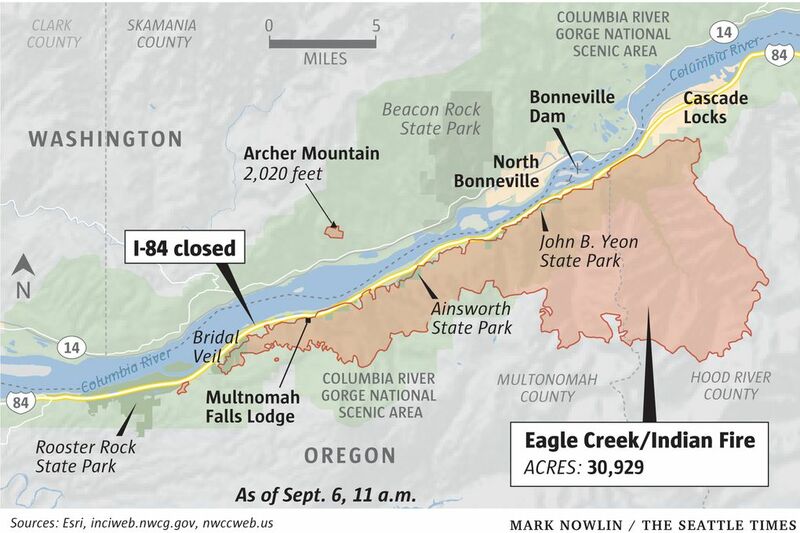 • The Eagle Creek Fire, on the border of Washington and Oregon, grew from 10,000 acres on both sides of the Columbia River Gorge to 31,000 since Monday, according to fire officials. It has also merged with the nearby Indian Creek fire and closures have been expanded “due to extreme fire behavior and rapid fire growth.” There are extensive evacuations and road closures along the Columbia River Gorge, including Interstate 84, which is closed from Troutdale to Hood River. This is a changing situation and the public is encouraged to check TripCheck.com for more information on road closures and evacuations. The winds have shifted to the west, bringing cooler and moister air to the fire area. The wind shift could push the fire to the east, especially in the higher elevations in the Mark O. Hatfield Wilderness. 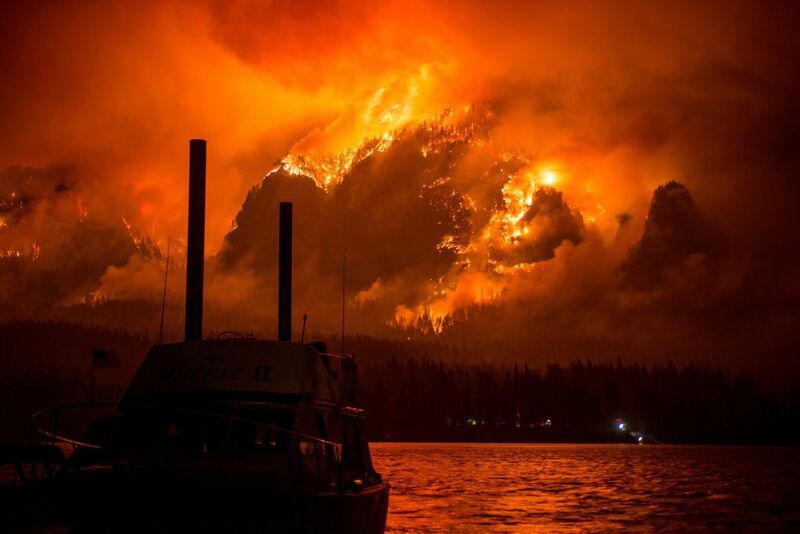 • In Washington state, the Diamond Creek Fire, near the Canadian border in the Okanogan/Wenatchee National Forest, grew from 75,000 acres Monday to more than 105,000 acres and has closed several roads and trails. Southeast winds may spur more spread to the west and northwest in Canada. Some growth is anticipated along most areas of the fire due to near record high temperatures and near record low humidity. 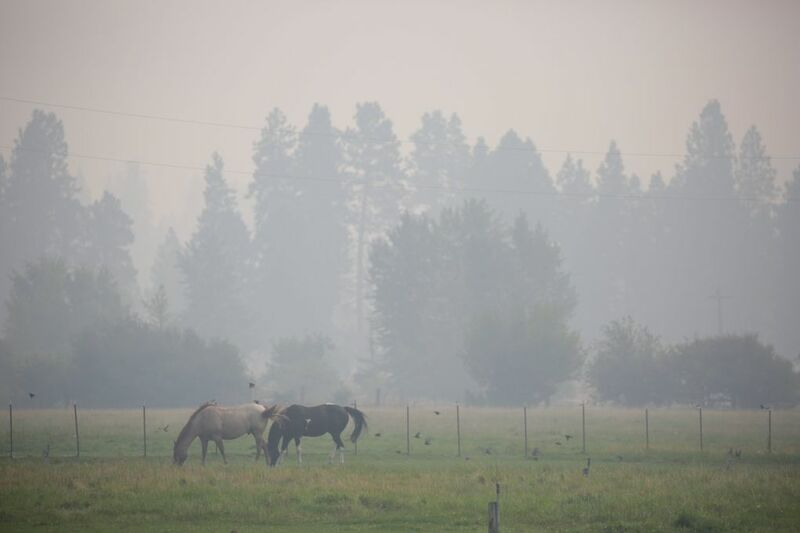 There are currently more than 60 roads or trails closed for public safety The smoke from that fire continues to affect air quality in the upper Methow Valley. • The Norse Peak Fire more than doubled its size in the last two days, growing to near 45,000, closing Crystal Mountain Ski Resort and prompting Level 3 “go now” evacuations of some residents in the Gold Hills Community and Pick Handle Basin, among others. 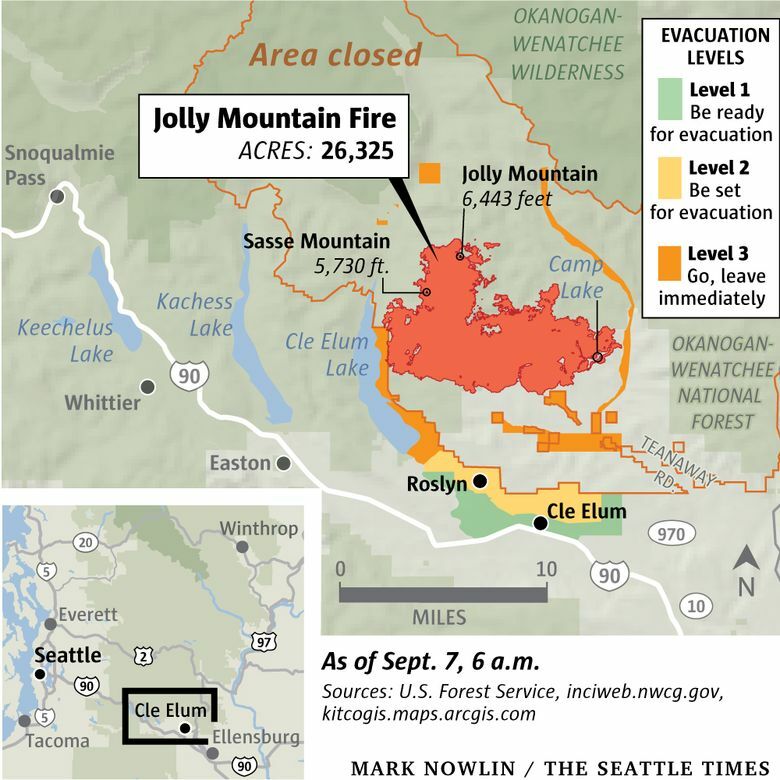 • The Jolly Mountain fire, near Cle Elum, Roslyn and Ronald, grew to more than 26,000 acres on Thursday. It had previously caused the evacuation of more than 1,000 people. A community briefing is set for 6 p. m. Thursday at the Walter Strom Middle School gym in Cle Elum. • The Chetco Bar Fire grew from about 150,000 acres to more than 176,000 acres between Monday and Wednesday, threatening the nearby coastal town of Brookings, Oregon. New fire starts from lightning, along with gusty and erratic winds near the storm area, are a concern. Embers have the potential to carry up to 1/3 of a mile from the main fire. The fire spread eastward over the weekend, leading to an evacuation order for all residents on Illinois River Road within U.S. Forest Service boundaries. 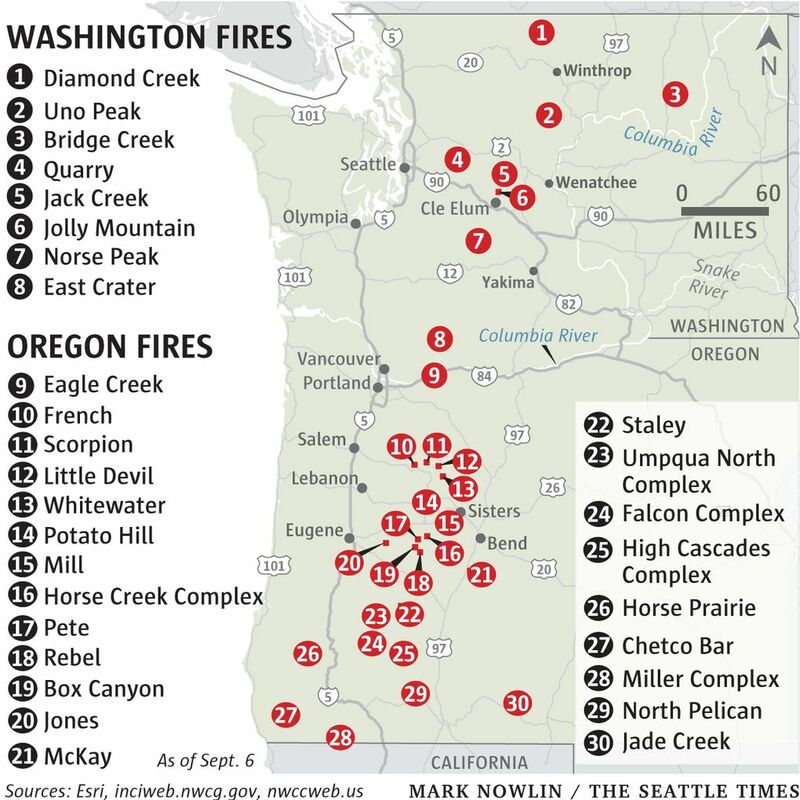 • The High Cascades Complex, meanwhile, had grown to more than 52,000 acres in Oregon, while that state’s Umpqua North Complex Fire grew to more than 38,000 acres.